George Condo, The Escaped Hippie, 1998 © George Condo. Artists Rights Society (ARS), New York. Exhibition view of works by George Condo at Grand Palais, exhibition design by bGc studio Photo: © Rmn-Grand Palais / Didier Plowy, Paris 2015. 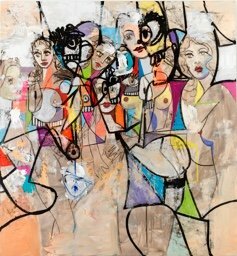 George Condo,Compression IV, signed and dated 2011. Acrylic, charcoal and pastel on linen, in artist’s chosen frame. 75 3/8 by 77 3/8 in. 191.5 by 196.5 cm. Courtesy of Sotheby’s.
. Photography by Martine Franck 2008 © Magnum Photography. 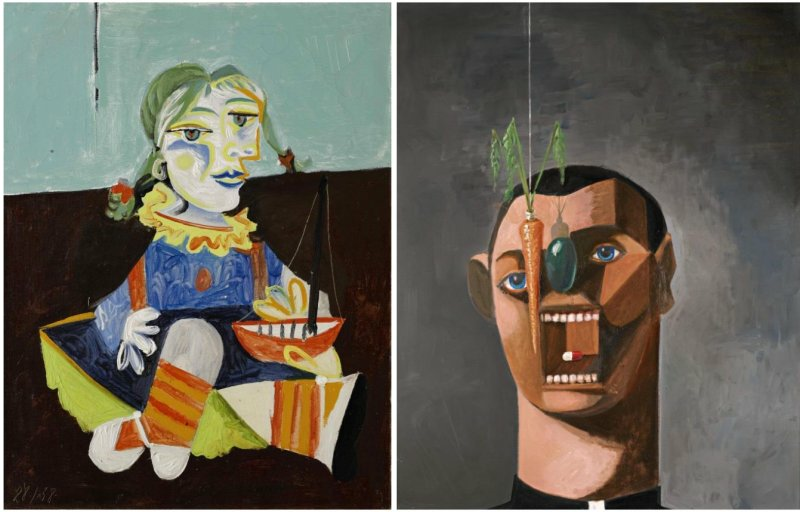 The Sotheby’s Hong Kong selling exhibition “Face-Off: Picasso / Condo” and the upcoming show at the Maritime Museum put American artist George Condo (*1957) in the spotlights for Asian audience. Following a rumour, Asian collectors are already rushing to acquire the works of the artist who is considered Picasso’s artistic heir. 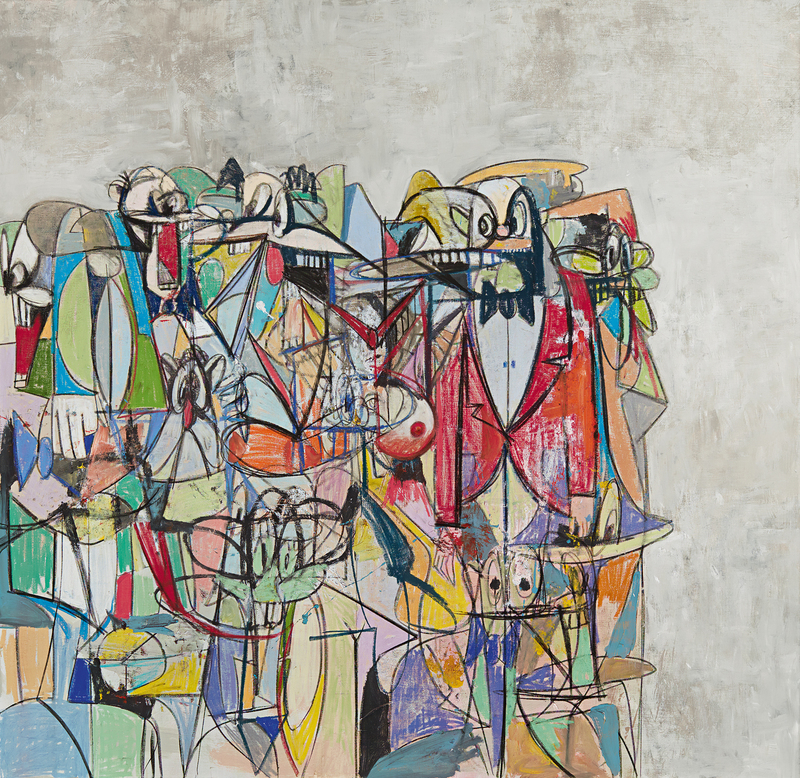 The name George Condo might sound unfamiliar to an Asian audience, but the artist has been a fixture in the Western art scene for decades. Hailed as one of the most prominent painters of the century, it is no blasphemy to see Condo’s name next to Picasso, for the selling exhibit Face-Off: Picasso / Condo (16 – 31 March, Sotheby’s Hong Kong). And a further consecration will happen at the Maritime Museum in Hong Kong at the peak of the Art Week. This is not the first time that Condo’s work has been shown alongside Picasso’s. In 2015/16 in Paris, – a city where Condo has lived for a decade – the Grand Palais opened the show Picasso Mania, showing emblematic works by the modern master alongside creations of contemporary artists. Condo was present with 17 works on the final wall of the exhibition. The artist recalled his first encounter with Picasso in 1969, aged 13, when he saw a picture of Picasso’s work in the newspaper. That, he said, was his first introduction to modern art. And that inspiration continued to nurture the young boy to become one day a great painter himself. In 2016/17, Berlin’s Berggruen Museum also explored the intuition of Condo as working in Picasso’s footsteps, by presenting George Condo. Confrontation. In the show Condo’s work was showcased side by side with modernist masterpieces, including those of Picasso. Condo’s art is indeed an open field of references. Since the early 1980s, Condo has been referring the mixture of humour, irony, and veneration in his work to the entire spectrum of European and American art. 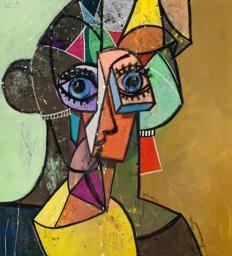 Looking back, 2016 was a big year for George Condo, not only for a series of acclaimed institutional shows, but also for the impressive market performance when 5 of his top 15 auction prices were recorded. The demand for Condo’s work might have come as a bit of a surprise to auction specialists back then, who were amazed at the nearly US$2m record price for the artist set during a July 2016 charity auction for Leonardo DiCaprio’s foundation. Ironically, what happened later on with the price boom has become “logical” in the eye of many of them. Just a year after the charity auction, another Condo painting Compression IV (2011) dethroned the US$2m sale as the current top record at US$4m, sold by Sotheby’s New York. This March at Christie’s London, Figures in Motion, a slightly smaller painting sold at US$2.6m, cementing Condo’s place as one of the top notch artists in the market. 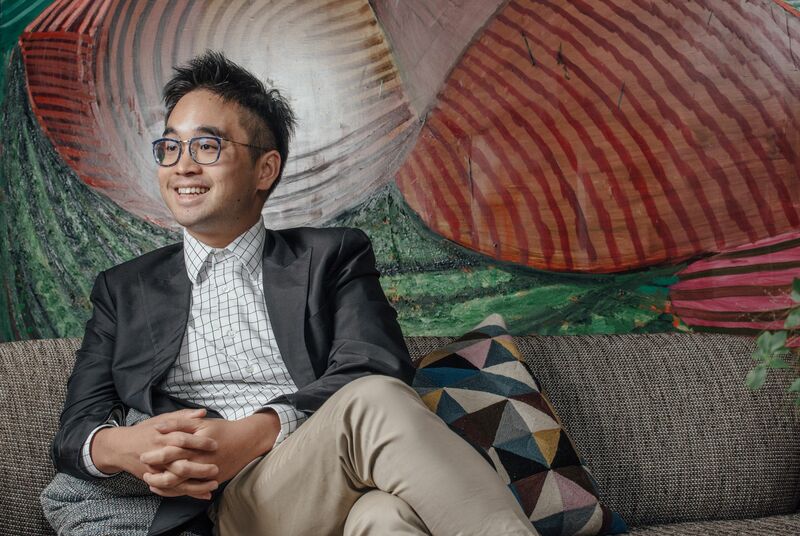 While institutional shows in Europe and the States helped highlighting the importance of Condo and consolidated his place in art history, the Asian art world is just opening up to this new learning. The first ever solo show of the artist in Asia, Expanded Portrait Compositions, will finally take place at the Hong Kong Maritime Museum, on view for two weeks only; while the Face-Off exhibit at Sotheby’s will juxtapose Condo once again with the modernist master, also for two weeks, coinciding with the sixth edition of Art Basel in Hong Kong. The eclectic yet singular style of the artist has always been characterized by vibrantly coloured, dynamic figurations incorporating surreal and expressionists elements, all the way to the Pop Art and Disney. However, Expanded Portrait Compositions will showcase a brand-new body of paintings and works on paper that are a bit different from the usual. Created by Condo specifically for the Maritime Museum, the show consists of portraits of single and multiple figures whose reconfigured faces and abstracted bodies exploded out of the picture frame in a chaotic charge of manic energy. Organised by Skarstedt Gallery and Sprüth Magers, the show’s eight paintings and five works on paper will allure to both Western and Asian audiences. Clearly, it was only about time that an interest for Condo would extend also to the Asia market. In that the selling exhibition Face-Off: Picasso / Condo at Sotheby’s Hong Kong will tell us what the response of the Asian art world. By positioning Picasso and Condo in the same arena, following in the footstep of big museums and institutions around the world, Sotheby’s is helping to retrace a lineage that runs throughout art history. Unexpectedly, the buzz around the artist has already started even before Sotheby’s opens their show, following a rumour early last week that the Hong Kong-based visionary collector Adrian Cheng of K11, has acquired the signature work of Condo at the Face-Off show, The Escaped Hippie (1998). 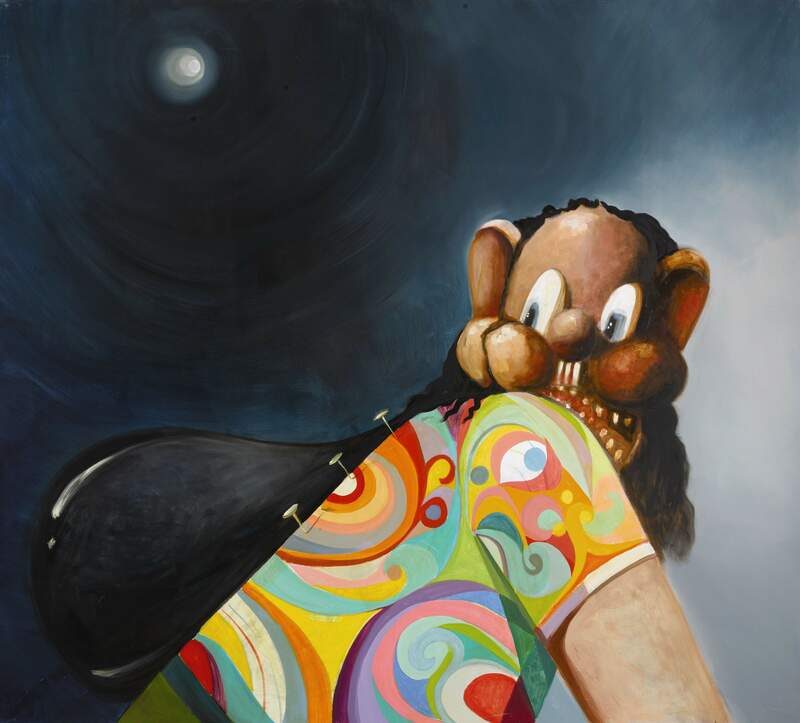 The painting presents one single moonlit figure on the run, with a cartoonish face, a colourful T-shirt, – which identifies him as an hippie, – and a heavy black bag on his shoulder. The “fugitive” is giving a look of utter horror and fear at an imaginary pursuer outside of the picture frame, while three pins neatly nailed on his back of T-shirt like a dart game. The hippies are an affectionate subject of Condo; in fact he has lived the quintessence of hippie culture through his friendship with the Hippie saints William Burroughs and Allen Ginsberg. Can this portrait be a homage to the Hippies? A nostalgia for the long lost friends? A sympathy for the modern hippies that he himself identifies with? Sotheby’s refused to disclose the purchase price. However, the price range of Condo’s works at the Face-Off exhibition is said to be between US$700k and US$1.7m. Adrian Cheng has always been a leading voice in the region. His Instagram, where he frequently posts artworks he likes, and documents his encounters with artists and curators, is followed by many curious collectors and dealers to peek and gauge the next hot things in the collecting trend. The rumour, be it true or not, has already started sparking a new craze for the work of Condo in the region. In fact, 72 hours was enough for the market to pick up the pace. Last Friday evening, another Condo fetched a high price at the Philip’s London sales. The French Maid Variation (2005), a small painting of 132.2 x 115cm, was sold at US$1.05m, presumably to an Asian collector, and occupies the 14th top auction price of the artist. A new wave of Condo-heat is expected to blow sky-high in Asia in the months to come. These hysterical monstrous representation of human psyche might not fall into the canon of Asian art; yet, it’s precisely a pinter’s ability to capture the intense psychological presence of the subject that glorifies the genre of Portraiture in Western art. Portraiture is a staple in the art of both Picasso and Condo. While shaping modern art as we know it today, Picasso also radically transformed the way of looking at a portrait. Playing along the visual perception of reality, his favourite subject-matters were an intimate group of family members and lovers, often caught in moment of emotional drama. A century later, George Condo took on some of these visual and psychological cues to continue the artistic revolution. We can see Condo’s re-contextualization of Picasso’s works, but there is one major difference between the two: whereas in Picasso’s cubism the emphasis is on creating a new way of seeing, for Condo the highlight is on the psychological perception. Inspired by tribal masks and Paul Cézanne, Picasso used to break objects and figures down into distinct planes in order to show different viewpoints at the same time and within the same space. In doing so, he emphasized the flatness of the canvas instead of creating the illusion of depth and perspective as we have seen in paintings from the Renaissance onward. In effect, Picasso, as an avant-garde artist, was advancing the art discourse and disrupting the norms of representation of reality before him. Of course, coming to the scene in the 1980s, Condo’s approach is more postmodernist. He is taking the visual methodology of cubism to emphasize what he is interested in: the mental state of the individual represented and of the viewer looking at the canvas. Condo coined the term “Psychological Cubism” to describe his approach: instead of space being his subject à la Picasso, he paints all of someone’s emotional potentialities at once. “Picasso painted a violin from four different perspectives at one moment. I do the same with psychological. Four of them can occur simultaneously. Like glimpsing a bus with one passenger howling over a joke they’re hearing down the phone, someone else asleep, someone else crying – I’ll put them all in one face,” Condo once explained in an interview published by the Guardian. By presenting the viewer with psychological images representative of what the mind sees, Condo’s images look like caricatures. With his playfully unsettling images he manipulates both the inner states of their subjects and the viewer, creating an uncomfortable state of turmoil. This agitation is cathartic to the artist, who is eager to get rid of his own monsters. He also credits Picasso for giving him a language to express his own inner torment: “That screaming head you see in Guernica kind of got consumed into their language of abstraction. And for me as a painter, I see all that when I look at abstract paintings.” Another terms he uses to understand the state of abstraction is “Artificial Realism,” in which irony and the grotesque are seamlessly fused together. 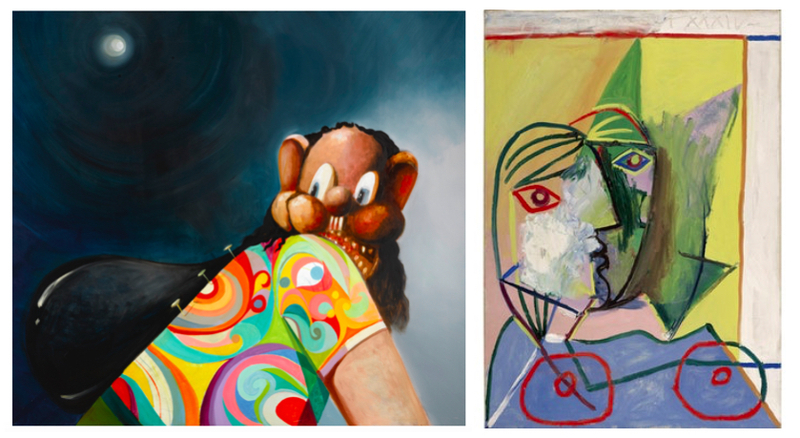 So, who is George Condo? Just like Picasso fully traversed the art scene of his times, Condo was and remains in touch with all the major art phenomena of his day and age. Born in Concord, New Hampshire in 1957, the artist studied classical guitar. As a young art student in late-70s Boston, he joined a synth-based art-punk band called the Girls. Fortuitously, when they played a gig in New York, he met fellow artist-musician Jean-Michel Basquiat. The encounter led to a close friendship; Basquiat convinced him to move to New York in late 1979 and began his professional career as a painter. In the early 1980s he emerged in the East Village art scene and worked in Andy Warhol’s factory, primarily in the silkscreen production studio applying diamond dust to Warhol’s Myths series. During that time he became a close friend with the graffiti artists groups, contributing to bringing about a revival of painting. The first public exhibitions of his work took place in New York City at various East Village galleries from 1981 to 1983. He then moved to Paris in the mid-1980s, working out of shoddy hotels in the Rue Castiglione and eventually luring his friends Basquiat and Keith Haring to join him. However, unlike his maudits pals who didn’t survived that rich yet dramatic period, and have their name mainly attached to the art ferment of the ‘80s, Condo continued to work and collaborate with artists from all fields, from visionary writers and thinkers like William S. Burroughs, Salman Rushdie and Allen Ginsberg, to pop stars like Kanye West and Jay Z. There is no better moment for Asian audience and collectors to learn more about the work of Condo and look at its artistic father Picasso with new eyes. It will prove a double-folded journey; into art history, and into one’s own psyche. 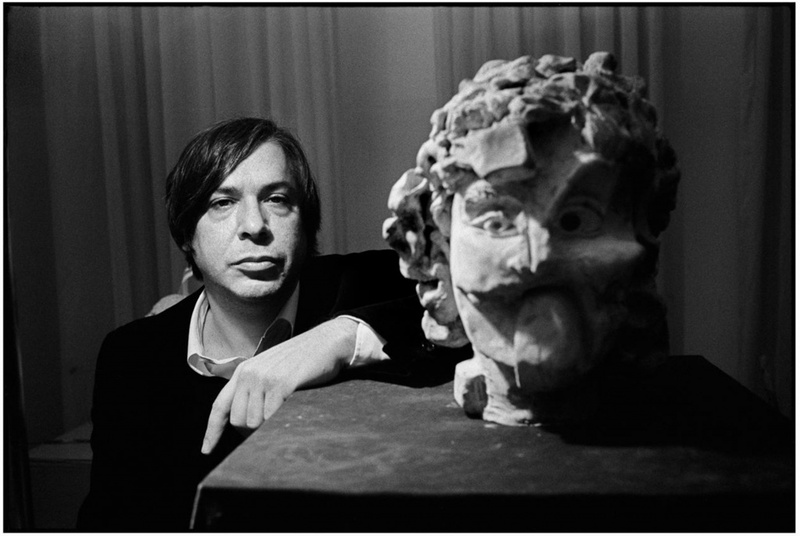 George Condo was born in Concord, New Hampshire, USA in 1957. He studied Art History and Music Theory at the University of Massachusetts in Lowell, and has occupied a prominent position in the art world for close to three decades. George Condo’s art can be viewed as a multi-layered experience incorporating art historical references ranging from European classicism to American contemporary culture, often combining elements of each to achieve a unique vision informed by all its sources. Condo has occupied a prominent place in the art world for three decades. His work is in the permanent collections of The Metropolitan Museum of Art, New York, The Museum of Modern Art, New York, The Solomon R. Guggenheim Museum, New York, Whitney Museum of American Art, New York, Albright- Knox Art Gallery, Buffalo, National Gallery in Washington D.C., The Museum of Fine Arts, Houston, The Judith Rothschild Foundation, Philadelphia, The Broad Art Foundation, Santa Monica, Tate Gallery, London, Centre Georges Pompidou, Paris, Fonds National d’Art Contemporain, Ministère de la Culture, Paris, Fonds Regional d’Art Contemporain, Ile de France, Paris, Staedel Museum, Frankfurt, Dakis Joannou Collection Foundation, Athens, Astrup Fearnley Museum of Modern Art, Oslo, Museu d’Art Contemporani, Barcelona, Marciano Foundation in LA, the Stedelijk Museum in Amsterdam, The Karpidas Family Collection in Dallas, The TATE Modern in London and Moderna Museet in Stockholm and the Doron Sebbag Art Collection, ORS Ltd., Tel Aviv. In 2016 George Condo’s work was the feature of a museum-wide exhibition, Confrontation, at the Staatliche Museen zu Berlin – Museum Berggruen Additionally, The Phillips Collection, Washington D.C. exhibited a major survey of drawings and “drawing paintings” titled The Way I Think in 2017. The exhibition travelled to the Louisiana Museum of Modern Art, Humlebæk in the Fall.